Allow me to share some interesting food facts related to Sindhi people. I may be wrong in certain observations, so do correct me if you disagree. 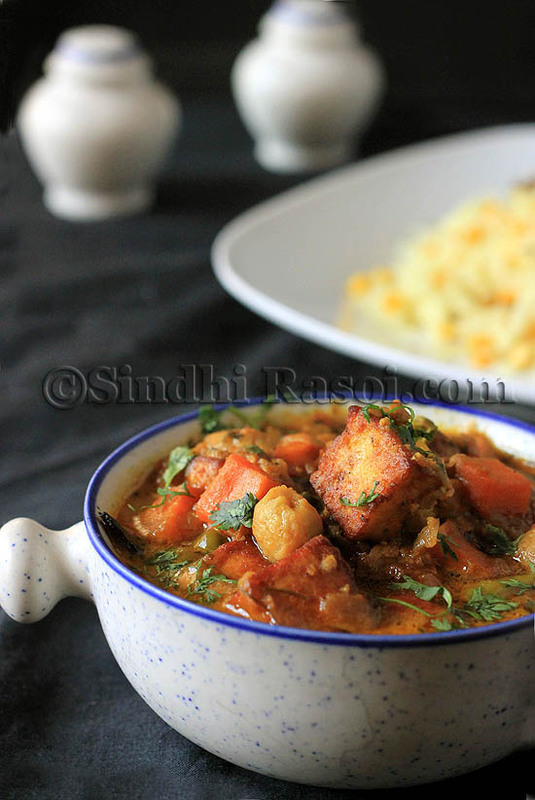 In general, Sindhis are divided into various types when it comes to food preferences. a) Those who eat non veg. food, be it goat meat, fish, eggs, chicken etc. b) Those who avoid non veg. food on some particular days like, Tuesdays, Fridays, ekadashi, satnarayan etc depending on their personal beliefs. c) Those who satiate their meat cravings at restaurants or buffet parties because nonveg. food is barred from their homes. d) Those who won’t eat meat or eggs per se, but won’t mind egg based cakes, desserts etc. 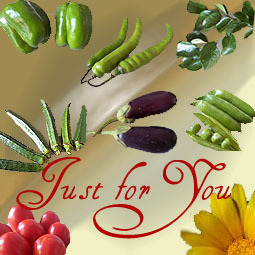 e) Those who follow strict vegetarian diet are mostly known as Vaishnu (Veshnu) or vegetarian. Most of the staunch vegetarians won’t consume any products containing eggs, gelatin, rennet, lard etc. The void created (if any) by the absence of meaty flavor or texture in their curries or biryani is filled with textured vegetable proteins (Soya chunks and granules). The soya granules that look and ( to some extent) taste like minced meat is widely used in curries or samosa stuffing or even in stuffed potato patties. The elder generation called Mutton as ‘bhaeyreen bhaji’ (bhaeyreen means ‘from outside’, bhaji = subzi), perhaps because nonveg was not cooked in their kitchens but was allowed to consume or serve to guests if purchased from food stall or restuarant. Many vegetarian Sindhis use the word Veshnu (Vaishnu) for any vegetarian dish, while some refer the Nutrela (Soya granules) curry as veshnu bhaji (curry). After breaking any fast, Sindhi people consume vegetarian food that is devoid of onion and garlic. By rule the food served to Brahmins during Shradh and Navratra, all the sympathy meals and the food consumed by the followers of Chaliha fast etc is cooked without onion and garlic. The recipe that I am going to share today is also known as Vaishnu bhaji. The term vaishnu is inspired from the word Vaishnav, and as many of you might be aware that the Vaishnavs cook their food sans onion and garlic. So the following recipe has a base of tomato, flavored with the spices like cinnamon, cardamon, clove and some powdered spices. Heat butter and oil in a pan (or kadhai ) and add bay leaf, followed by cinnamon, cardamom and cloves. Add Cumin seeds and wait till seeds change color. Add pounded ginger (or use ½ tsp of ginger paste), pounded green chilies and then add the grated or pureed tomatoes and lower the flame to minimum. Cover the pan with a lid and let the tomato cook for a while. Keep a check on water content of the gravy and add some water if needed. Meanwhile, peel the carrot and cut in cubes. In another pan, heat some oil and fry carrots on low flame till soft. Do not let the carrot turn brown. Remove from pan and set aside. Add some salt to paneer cubes and fry in batches, till light brown. Keep this aside too. Fry fox seeds till the seeds change to a darker shade. Coming back to the tomato gravy, add turmeric powder, coriander powder, red chilli powder and cook well till the oil leaves the sides of pan. Add around 2-3 cups of water, salt, garam masala powder, kasuri methi and cook further for 2 minutes. If using fresh peas, blanch till soft. If using frozen peas, just add as it is, in the tomato gravy, along with paneer, carrot, phoolpatasha. Blend the milk/ cream and soaked cashews to make a smooth paste. Add this paste to curry and simmer the curry for 5 minutes. Garnish with coriander leaves before serving. 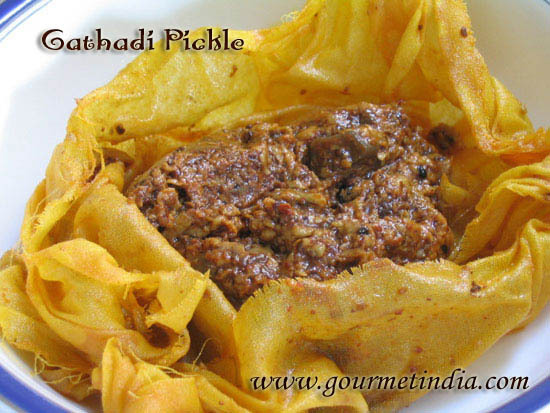 Goes well with steamed rice and roti. Great recipe! I had to add a good amount of sugar to balance the tart tomatoes since we don’t eat chillies. Tried today wonderful recipe.thanks for posting. Mmmh interesting dish always thought food cooked with no onion just wont cut it…Worth a try indeed. Wonderful post. Learnt alot about Sindhis and their food.. actually many of close friends are sindhis but still know alot of the facts mentioned in the post. Thanks for sharing. Loved this sabzi . Even in our house, during festivals we donot consume onion or garlic. This recipe would be perfect on such occassions. I will definitely try this sabzi..thanks again! !